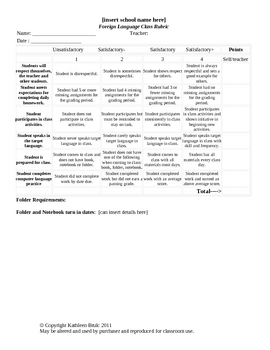 This is a basic rubric which can be edited by purchaser for any foreign language classroom. It is particularly suited to the elementary or middle school classroom. This rubric would be useful for teachers using both letter based grading systems and ungraded "satisfactory-unsatisfactory" systems. The rubric is also helpful for student self-evaluation.This work is licensed under a Creative Commons Attribution 3.0 Unported License.